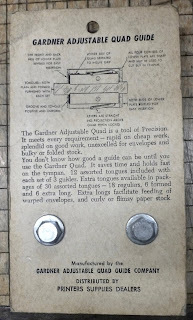 Available is a set of Gardner Book Clamps for holding paper flat during trimming books/pamphlets in your paper cutter. 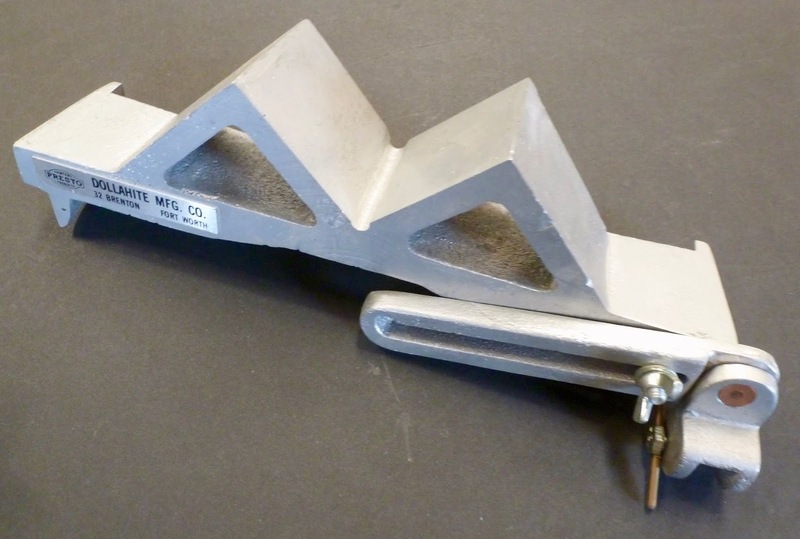 While manufactured for Challenge, these Gardner clamps will fit any paper cutter that will allow for up to 5/8" for fingers/fins on back gauge. Cast brass, chrome plated. Easily installed. 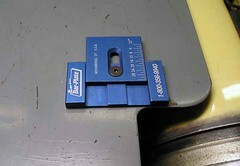 Two clamps in an original holder. $50. Large stock of printing papers. Good quantities. Handmades, mouldmades, domestic and imported rarities. Prefer local pickup. For Sale. 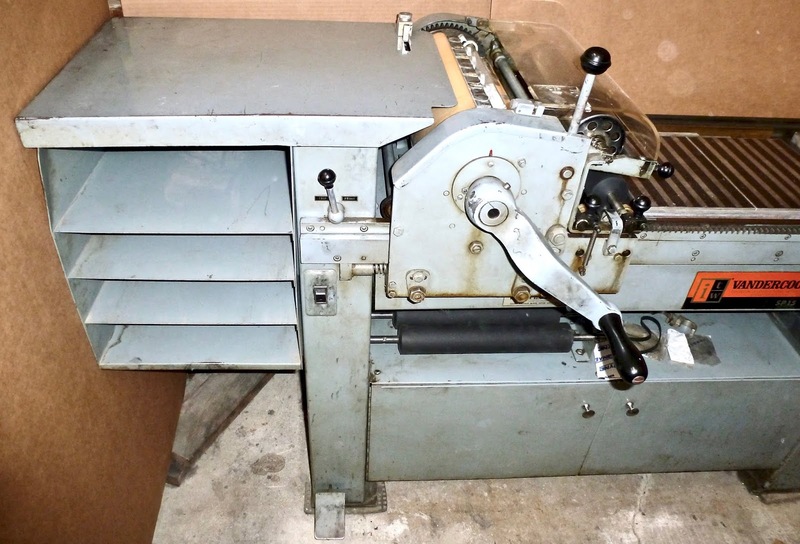 Challenge Paper Cutter, Style 265. Serial No. C16594. Made in U.S.A. by Challenge Machinery Co., Grand Haven, Mich. Width between table frames, 26-1/2 inches. Length of cut 26-1/2 inches back of knife. Hand operated, with safety device. Steel measuring tape. Maximum cut thickness, 3-1/4 inches. Minimum cut, 3/4 inch. Extras include manuals Challenge Style 265-305 Instruction and Parts List and Challenge 265-305 Style H Cutter Manual and Parts List; two extra blades, one sharp, one dull; ten new white plastic cutting sticks; Walden Worcester wrench for blade bolts (very useful); hand paper sheet adjusters from Crown Williamette Paper Co. and Kemper Tools RB2. Shipping notes: Weight is 1,020 lbs. Height of table from floor, 34 inches. Width of cutter, 44 inches. Length of cutter, 58, inches. Height of cutter, 53 inches. Will pass through door with lever and balance weight removed, 37 inches. Will pass through door with table removed, 28-1/2 inches. For Sale—Vandercook SP-15. The primary printing press of The Bieler Press since the early 1980s. It was originally purchased “as new” [not previously used by original owner], it has served the Press well, and has been very well maintained throughout its productive life. The bed has been precisely leveled. Absolutely trouble free in its operation. The serial number is 29493 [late 1972–one of the later SP-15’s to be manufactured]. Photos of work done on the press can be seen here and throughout this blog. More photos of the press (uncleaned) are available upon request. 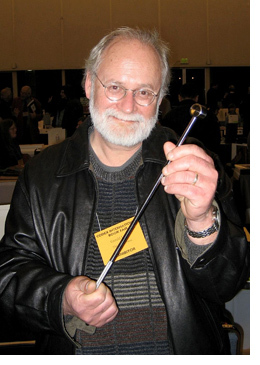 Gerald Lange at the very first CODEX with his Bieler Press roller setting gauge made at Jet Propulsion Laboratory. 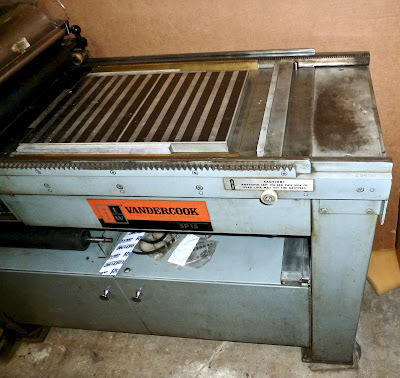 Gerald Lange: Right now I'm down to two presses, a Vandercook SP-15 and a Vandercook Universal III. I bought the 15 as new in the early 1980s. It has served me very well, never had a problem with it, and I tend to use it for most work as the cylinder is very well balanced across the entirety of the press bed. The Universal is an automatic and I picked that up from a client a few years ago. He had to quit printing because of health problems and died shortly after. I have been working with a publisher of art prints/gig posters so the press will come in quite handy, because of it's size (20 inches) and the power assist. In the last 35 years I've had maybe a dozen Vandercooks but these seem the best by far. For Sale. Misc. press parts & supplies, plate processing supplies & tools, et al. • Turtles. Two turtles available. 24" by 28", 24" by 30". Height is adjustable. Heavy steel tables with swivel casters. 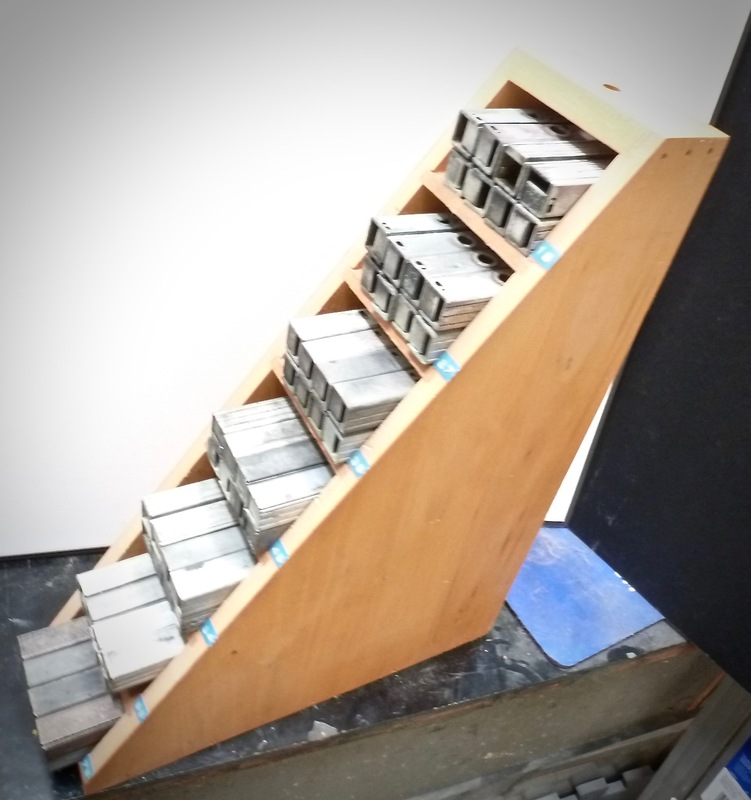 Very useful for moving heavy letterpress materials, especially to and fro press. • M.V. Huffman Lightweight Expandable Speed Furniture in Cabinet. Cabinet holds 21 pieces of magnesium expandable furniture: 15 x 30 (2), 20 x 20 (2), 20x 30 (2), 25 x 20 (2), 25 x 30 (2), 30 x 20 (2), 30 x 30 (2), 35 x 20 (1), 35 x 30 (1), 40 x 20 (1), 40 x 30 (1), 45 x 30 (1), 50 x 30 (1), 50 x 30 (1). Indispensable. Made by M.V. Huffman Mfg. Co., LA, Calif. Cabinet measures 13-3/4" by 14-1/8" by 4-5/8" (5-3/8" with furniture). 40+ pounds with furniture. The cabinet is very well made (but has a couple of slight impressions on top) and painted (no manufacturer’s name). • Challenge Hi-Speed Quoins in Cabinet. 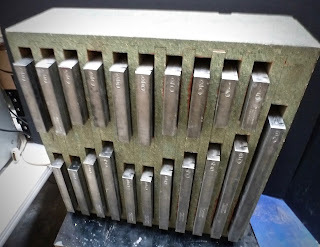 Cabinet holds eight each of 3", 4.5", 6", 7.5", 9", 10.5", and 12" long high speed quoins. American Printing Equipment & Supply Co. cabinet is well made and in excellent condition. Very rare. Challenge Mchry. Co. quoins are complete. Used (with ink stains) but all in working condition. 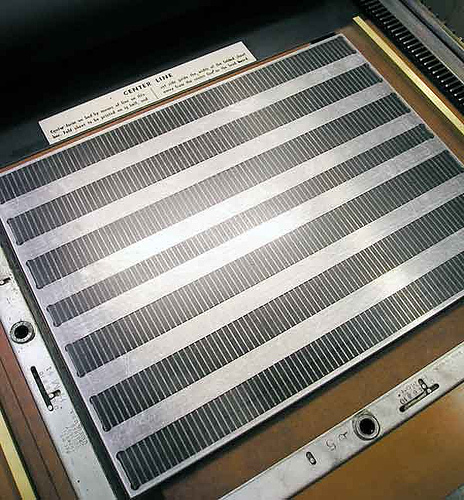 Challenge sold the product line to Bar-Plate in 1996. The 4.5", 7.5", and 10.5" are no longer made. Cabinet measures 15-11/32" by 11-9/16" by 4-7/32" and with quoins is very heavy (over 50 pounds!). • Boraxo Pro-Pumice bar soap. Unopened bars of a hard-working soap that effectively removes grime from hands. Manufactured by Dial but recently discontinued. A professional grade hand-cleaning bar with moisturizers including aloe vera and crushed apricot seeds. Combines cleaning power of soap and borax with scrubbing action of pumice. Biodegradable, recyclable packaging. 32 4.25-oz bars in box. Total with shipping, $78. 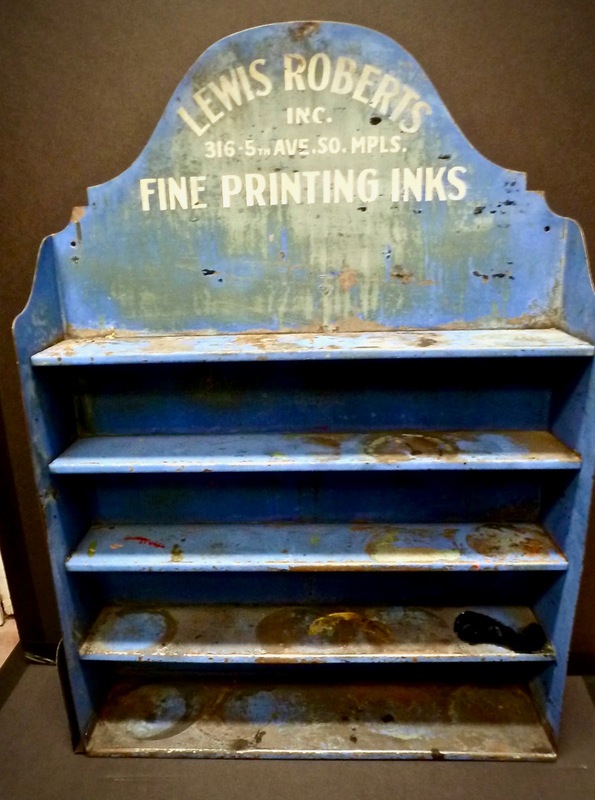 • Lewis Roberts Fine Printing Inks wall display. Vintage promo wall display for ink cans [from Lewis Roberts Inc., Mpls.]. 11-1/4 pounds. 27-1/4" high, 19-1/2" wide, 4-1/2" deep. Five shelves measure 18-3/4" by 3-3/8" each. Structurally very good, thin steel. Quite retro (!) with many old ink stains, etc. $275, plus shipping and sales tax where applicable. 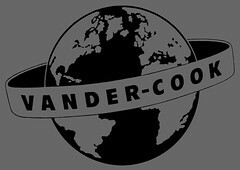 • Vandercook press pins. Alloy steel pins used throughout Vandercook SP presses and others. Must have on hand in case of breakage on press. Nominal pin diameter is 5/16" (0.0002" tolerance/oversized), 1-1/2" long, 11,500 lb single shear, Grade 8. 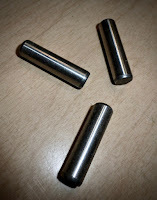 Pin has one beveled and one rounded end. $4.75 per (no limit). 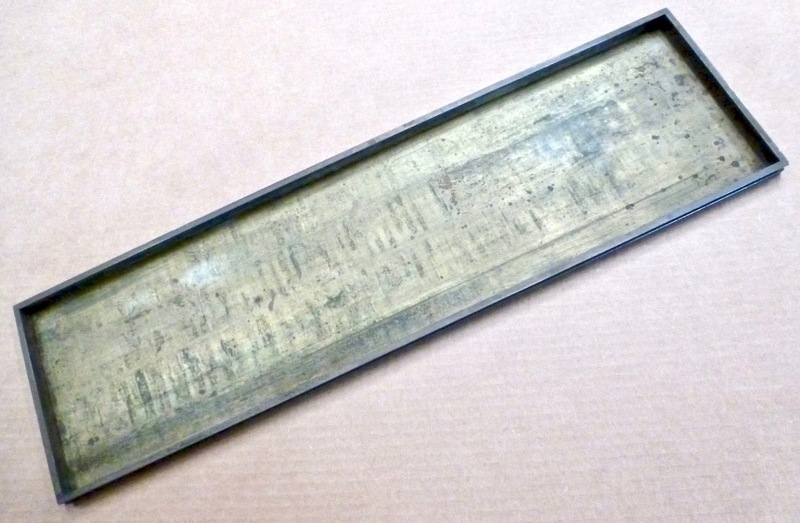 • Storage Brass Galley Tray. Chicago Brass Company (Patented, Kenosha, Wisconsin). 24" long by 6-3/4" wide by 5/8" deep. Borders (all around) are 1/4" wide with similar grove. Weighs 4 pounds, 1-1/2 ounces. Colored through use and outside bottom scratched but no noticeable internal scratching. More pics available. $95.00. • Steel Press Points. 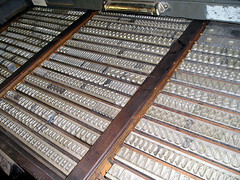 Steel press points are often used on cylinder presses such as a Vandercook to prevent slurring of the type at the bottom of the sheet. They are locked in the lower part of the form outside of the printing area. These catch the sheet as it flips away from the cylinder and prevents it from dragging across the type. They are less than type-high thus do not print. They measure 10 picas in length, one pica thick, with points separated from each other by 5.5 pica. 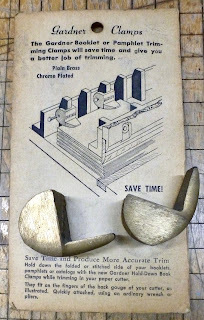 Made with Linotype lead metal. $40 each. • Hi-speed quick change aluminum furniture, MV Huffman Mfg. Co., LA. In addition to the cabinet with 21 sets of furniture (above), sold separately are singles from 10-pica to 60-pica. Inquire. 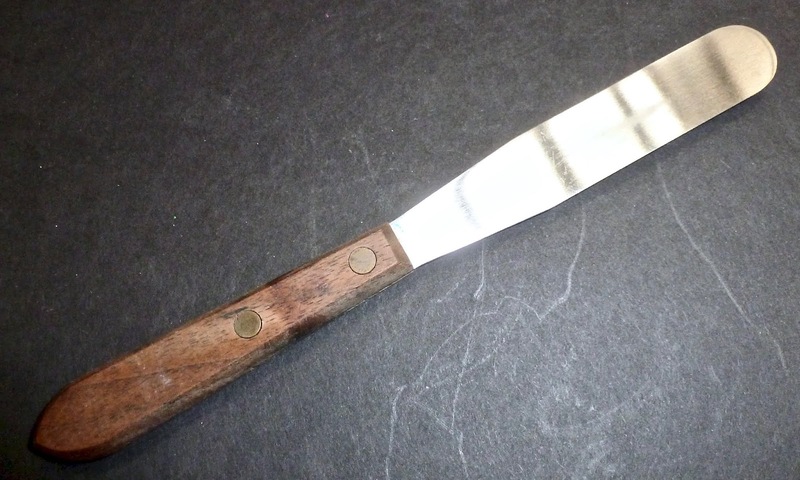 • New brass .918 bearer supports 24-pt by 26 inches from Stephenson Blake, Sheffield, England. Price is $140 each. Sold in sets of two only. • Double S font of English Resalite furniture in double font wood cabinet. $1,800 pick up only. • Aluminum furniture made in Holland. Small clean family of 40-pica length in widths of 6-pica (2), 4-pica (4), 3-pica (3), 2-pica (5). • Urethane Sponge Roller. Quickly removes excess moisture from the surface of photopolymer plates after washout during processing. 18" long small pore sponge roller (1-3/8" diameter) with 22" hollow aluminum shaft. These last quite some long time if stored in a container of water. New, in wraps. $149.95 plus shipping and sales tax where applicable. • Cylinder press bed plate. 33 by 20 inches (originally designed for a Vandercook 320). High grade 303 stainless steel (resistant to corrosion, non-magnetic) deadly precise at .05" thickness, and parallel from end to end, length and width. Produced at Jet Propulsion Laboratory (but never went to outer space!). Make a really good offer. • Raw Photopolymer Plate Strips are available in various lengths at 2 to 4 inches in width at $25 per pound (minimum). See our blog on platemaking for more information. Only Toyobo plates are sold. In stock are strips of KF95 and KM152. • Paper Humidors. 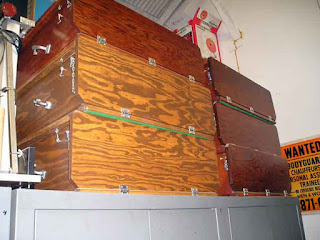 Humidor boxes are used for storing and handling dampened paper during editioning. Dampened paper can be held for up to 3 days. Includes sponges. About 20 pounds each. These were constructed on the model described in Lewis Allen’s Printing With the Handpress. These are all from the Glen Price version produced in the early 1990s. These hold sheets up to 16 x 25 inches. Inside height including upper sponges is 7 inches; including handling is 3 to 4 inches during production. Best used in sets of two. $275 each, plus shipping and sales tax where applicable. 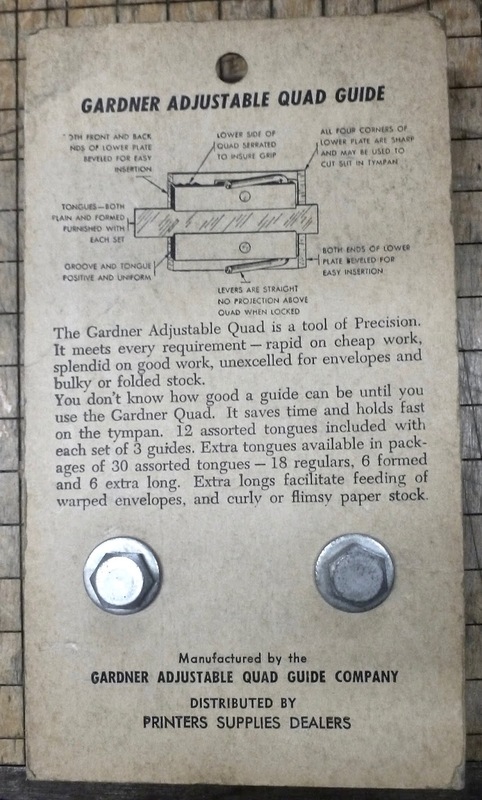 • Press Operator Side Paper Guides. Bar-Plate Low Profile Adjusto Guide. 1" by 2". Adjusts with Allen screw (included). 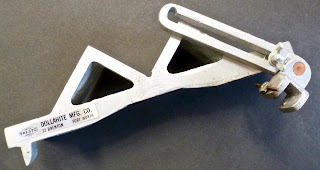 Imprinted Vernier scale (32 nds). Attaches with double-coated tape. $60.00 (ships free USA). 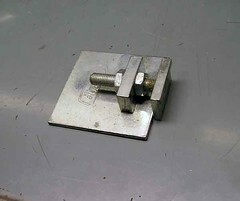 Bar-Plate Platen Guide. 2" by 2". Adjusts with box wrench. Attaches with double coated tape. $47.50 (ships free USA). • MANY MORE ITEMS TO COME ! ! ! The Bieler Press stocks several high quality calipered press packing materials, specifically those configured for hard, yet resilient, packing on letterpress flatbed cylinder presses. All materials supplied will fit 15- and 20-inch presses per cylinder size. Currently stocked items include .002" and .003" Riegal, .004"/.005" LithPakII, and .006" Drum Head undersheets, as well as .007" PolyPak (tympan top sheet for 15") and .021" (15"), .017", .011" Kimlon (tympan bottom sheet). These are available in economical small lots. Materials provided are not scored or die cut for specific presses and sheet sizes are maximized for largest 15- and 20-inch presses, thus you will need to cut to fit using templates. A PDF of sizes and prices is available upon request. T-shirts offered are super heavyweight 100% pre-shrunk cotton manufactured by Gildan. 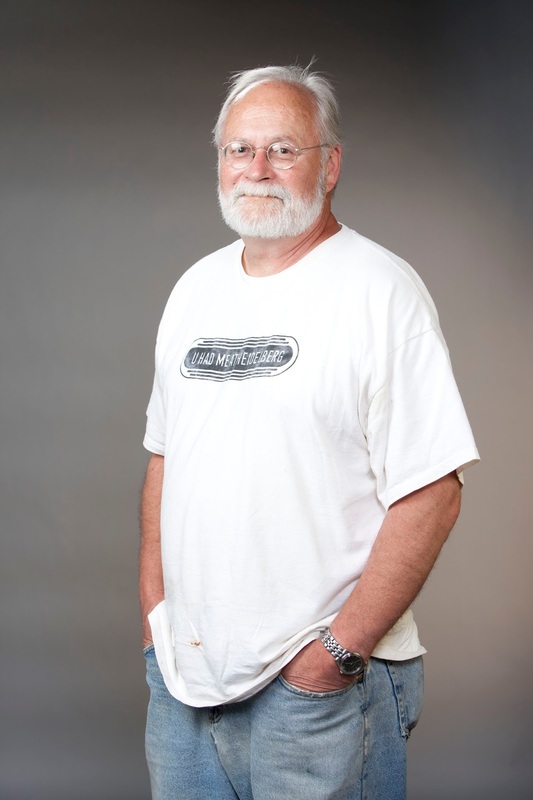 Loose, comfortable fit—great letterpress printing shirts (your mileage may vary). Limited serigraph printings. U Had Me at Heidelberg in ‟Original” typeface. Garment color is natural (off white). Black imaging, centered, upper chest. Logo measures 9-3/4 inches wide in the largest size. Available in S (4) M (1) 3XL (4) while they last (L XL 2XL are sold out). Available direct from The Bieler Press. $19.95 each (California residents add $1.80 state sales tax). Dominante, designed by Johannes Schweitzer in 1959 and cast by Ludwig & Mayer. Roman: 12-, 14-, 16-, 20-, 24-, 28-, 36-, 48-pt. Italic: 14-, 16-, 20-, 24-, 28-, 36-pt. Bold: 14-, 16-, 20-, 24-, 28-, 36-, 42-pt. There are 28 cases (including one case with type in wrappers, and extra sort case as shown). 1,080+ pounds. Claudius Fraktur, designed by Rudolf Koch and cast by the Kingspor foundry. 10D-, 12D-, 16D-, 18D-, 20D-, 24D-, 30D-, 40D-pt. There are 10 cases. 350+ pounds. Also available are several rare and hard-to-find metal typefaces from various domestic and foreign foundries. The fonts are in very good to as new condition. Large lot (74 pounds) of metal spacing material in small pica (11-pt): 5.5-, 5-, 4-, 3-to-the-em, en quad, em quad. This sizing was specially ordered for hand composition. Originally purchased for the production of a book-length manuscript (very clean and sorted). Cast by the Press and Letterfoundry of Michael & Winifred Bixler. 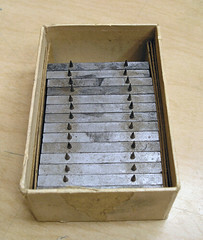 Small sets of large point size foundry-cast script spacing material: 42-pt, 48-pt, 54-pt, 60-pt, 84-pt. Total of 25 pounds. This is used in setting foundry straight-bodied script where the letterforms extend beyond the boundary of the body. Large amount of metal type spacing material for sale in the form of medium to large point size quads: 24-pt em (11.75 pounds), 30-pt em (23.50 pounds), 36-pt em (9.50 pounds), 48-pt em, (11.50 pounds), and 48-pt x 36-pt (16.25 pounds). We also have small amounts of large and odd-size spacing material. This was made from recycled calligraphy paper (fairly smooth on one side, slight bit of texture on the other) and is a very durable text weight (40± lbs per ream). Extremely color fast. Non-acidic. 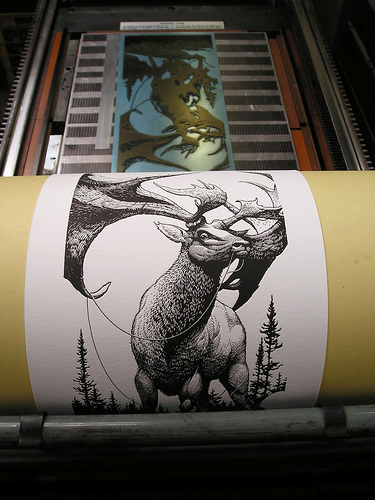 Very useful as endsheets and a great letterpress paper; prints well without dampening. It also prints without problem with a laser printer. Size is 21.5 x 31 inches. This paper was discontinued in 1996. 1-99 sheets $1.25 per sheet; 100+ sheets $1.00 per sheet. 1-4 bundles: $87.50 per bundle (broken bundle overage per color at .75 per sheet); 5+ bundles: $75.00 per bundle (broken bundle overage per color at .675 per sheet). Offered are No. 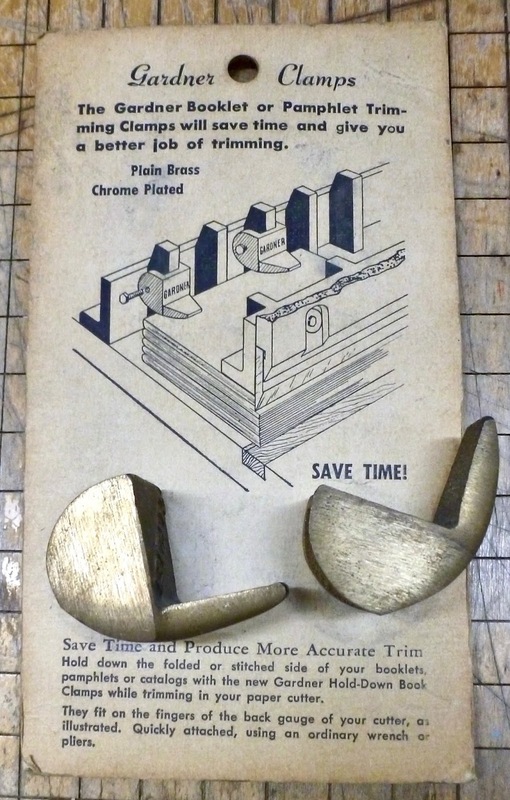 4 Standard Jaw Hooks for securing and registering photomechanical engravings on PMC Warnock Diagonal Block Bases. Bevel at 20 degrees. These hooks are designed for thin-lipped style bases and will not fit the later thick-lipped bases. Patent on hooks is Dec 11, 06 / Oct 31, 11. Manufacturer is Printing Machinery Co. They are used but functional. Also available are as new hooks, keys, key bits, for honeycomb bases. * Misc. cylinder press, plate processing supplies & toolss, et al.